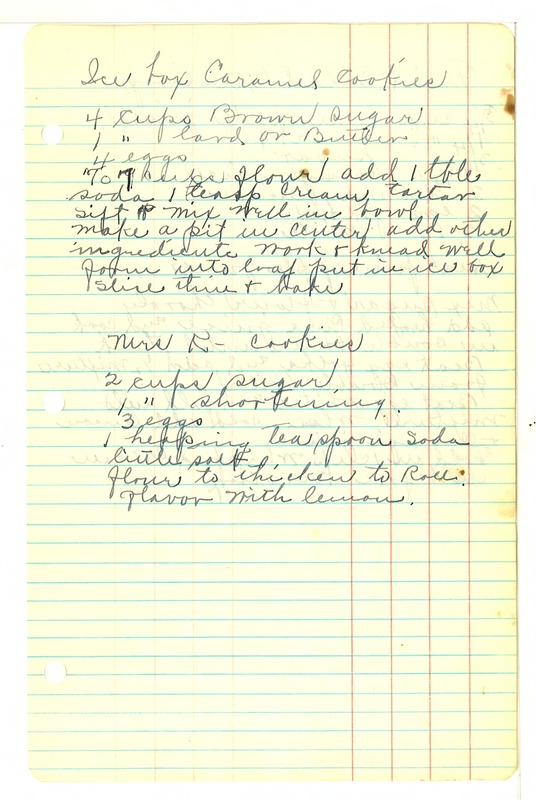 Ice box Caramel Cookies 4 cups Brown sugar 1 " lard or Butter 4 eggs To 7 cups flour add 1 tble soda 1 teasp cream tartar sift & mix well in bowl Make a pit in center add other ingredients work & knead well form into loaf put in ice box Slice thin & bake Mrs K- Cookies 2 cups sugar 1 " shortening. 3 eggs 1 heaping teaspoon Soda little salt flour to thicken to Roll. flavor with lemon.